You're the kind of woman who is always on the go. You need jewellery pieces that'll keep up with your pace. This sophisticated bracelet was designed for your hectic schedule. The best part is it'll transform your ensemble from casual to dressy with little to no effort in your part. That's one less thing you'll have to worry about. 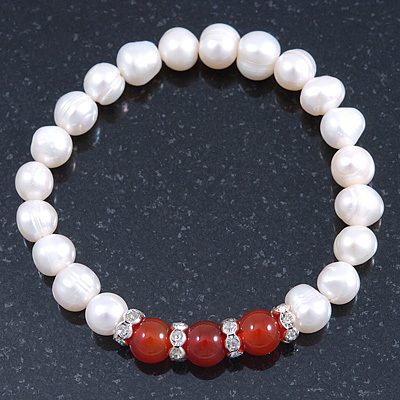 Featuring a single strand design, made of 8 mm white freshwater pearls and decorated with 3 brick red carnelian stones and 4 crystal rings. Also, check our store for a matching necklace N02563.